Fortunately, I have finally recognized that no one will be following me around to shoot a series of the “Heartbreaking Errors and Stupefying Successes of la Cuoca Ciccia’s Kitchen.” And so I am making a concerted attempt to photograph my efforts this week. 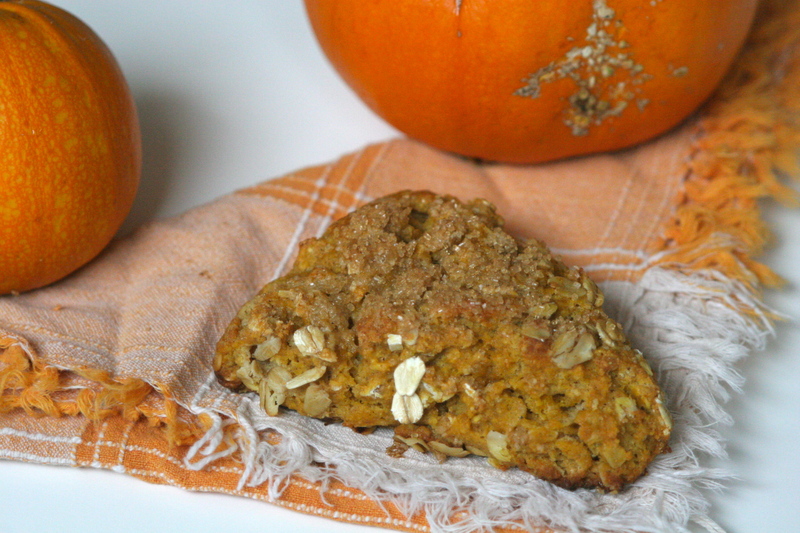 Which brings me to pumpkin scones. If you have followed this neophyte blog in the past half-year or so, you may have gathered that I adore breakfast and baked goods, especially scones. 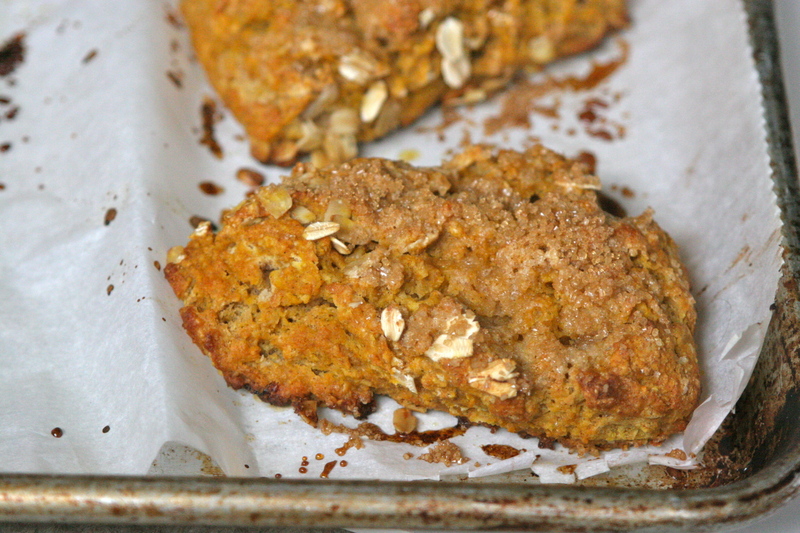 Every year I cannot help myself from making a couple of batches of pumpkin scones, but this year I decided to go the way of some underappreciated whole grain flours from my pantry. Preheat the oven to 400F degrees. Line a baking sheet with parchment paper. In a mixing bowl whisk together the dry ingredients (kamut flour, a.p. 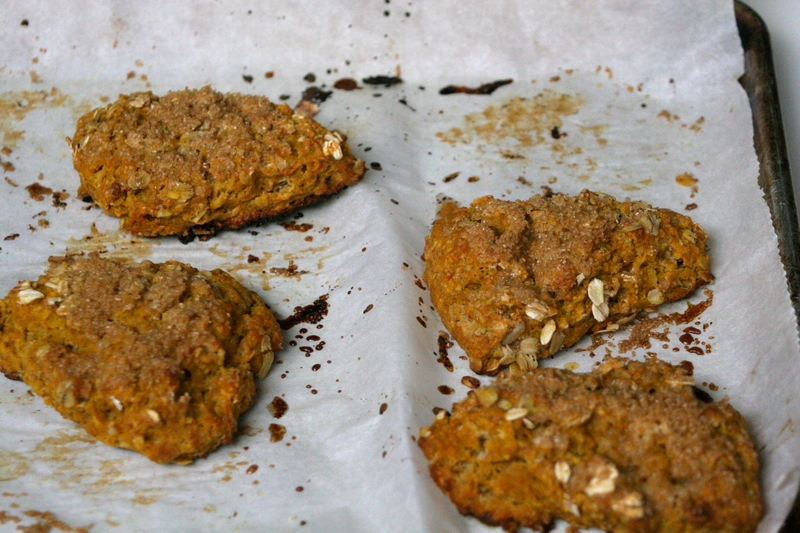 flour, oats baking powder, brown sugar, spices, and salt). Cut the butter into 1/2-1 inch cubes and carefully work into the mixing bowl of dry ingredients with two forks or a pastry blender until little pea sized clumps appear. Whisk together the wet ingredients (buttermilk, pumpkin puree, egg, and molasses) and stir into the mixing bowl of dry ingredients and butter until the dough roughly comes together. Dust a clean work surface lightly with flour and (if using) extra rolled oats. Knead the dough in the bowl twice or thrice with your hands, enough to make it barely come together in one mass, and dump it out onto the floured surface. Pat down to make a dish about 2 inches high and cut into 8 scones. Place on the parchment covered baking sheet, brush the tops with milk or buttermilk, and generously sprinkle with Demerara sugar. Bake for about 15 minutes, turning the back sheet from back to front halfway through baking, until the scones are golden brown color on the top and a toothpick comes out clean. 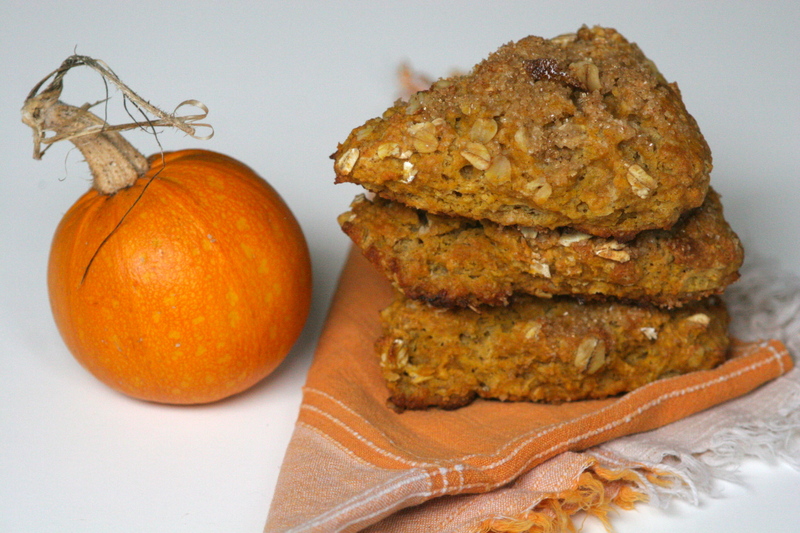 This entry was posted in Breads, Breakfast, Whole Grains and tagged buttermilk pumpkin scone, kamut oat pumpkin scones, kamut pumpkin scone recipe with Demerara sugar, perfect pumpkin scones, pumpkin oat scones, pumpkin scone demerara sugar, whole grain pumpkin scones. Bookmark the permalink. OK, you win! Ten points for being cute about it. Hubby & I have been doing amazingly well on a desperately needed, hopefully short term, low-carb diet. These scones look so irresistible that the term is about to get much shorter. Can’t wait to try them! I hope short term too! Let me know how they go when you make them. these look and sound so yummy. thanks for sharing! !